THE peaceful tenor of Bede’s monastic life was apparently uninterrupted by absence or travel, and his own words might be thought to afford sufficient authority for the supposition. A controversy, however, on this subject has arisen from a letter first published by William of Malmesbury, which to this hour has not been satisfactorily decided. This historian says that Bede’s learning and attainments were so highly esteemed, that Pope Sergius wished to see him at Rome and consult him on questions of importance and difficulty relating to the Church. He accordingly quotes a letter, addressed by Sergius to Abbot Ceolfrid, in which he is requested to send Bede without delay to Rome. Now it is argued, and apparently with truth, that Bede would not have dared to decline an invitation coming from so high a quarter; and yet it is all but certain that Bede never was out of England. He tells us distinctly that his whole life was spent in the neighbourhood of Jarrow; and that the letters, which he has inserted in his Ecclesiastical History, had been procured for him at Rome by Nothelm, which would certainly lead us to infer that Bede was not there himself. Moreover, he tells us in his treatise, De Natura Rerum , that he was not with the monks of Yarrow, who went to Rome in the year 701. The last editor of the Ecclesiastical History thinks that he has succeeded in clearing up this difficulty, by the discovery of an earlier copy of the letter in question, [Tib. A. xv. fol. 6, b, in the British Museum,] than that given by William of Malmesbury. “Sergius Bishop, Servant of the Servants of God, to the holy Abbot and Priest Ceolfrid. Health! “In what words or ways can we describe the mercy and unspeakable Providence of our God, and give due thanks to Him for his numberless benefits towards us, who brings us, when we are lying in darkness and the shadow of death, to the light of his knowledge! “The favour of your blessing, which your devoted piety sent to us by the present bearer, has been received by us with pleasure and delight, according to your directions: and we pray the Lord and his apostles for your conscientious purity, that he, by whose preaching we came to the light of truth, may give us great things for small, and grant us the everlasting blessings of his heavenly kingdom. Such is the letter of Pope Sergius, which has been preserved by William of Malmesbury; and some modern critics have not hesitated, from the difficulties before mentioned which it involves, to pronounce it altogether spurious. It is argued that Bede did not take priest’s orders till the year 672, whereas this letter was written in 670, and Pope Sergius died in 671. This fact seems to throw some light on the letter of Sergius. If, as is probable, he therein alludes to this charter, he does so in terms not so clear as would have been made to appear by Malmesbury, if the letter were a forgery, and yet sufficiently clear when the allusion is explained. This is indirect testimony to the genuineness of the document. As to the word “presbyterum,” priest, being interpolated by Malmesbury, he might have done so very innocently, knowing that Bede was afterwards a priest, and at the moment not reflecting that he was not one at the time. It is a most obvious error for an historian to describe a man in his youth by the titles which he received at a later period of his life. Ut—absque ulla remoratione religiosum Dei nostri famulum venerabilis tui monasterii ad veneranda limina Apostolorum, &c. non moreris dirigere. That you do not delay to send some religious servant of God of your venerable monastery to the hallowed threshold of the Apostles, &c.
To this interpretation there is one insuperable objection; in a passage where no individual has been previously mentioned, “devotum Dei nostri famulum” cannot mean some or a devout servant of God: the insertion of quendam is absolutely necessary. It must mean “the or that devout servant of God,” and to make this intelligible some proper name is required. The inference would rather be, that in the MS. in question the word Bedam had been inadvertently omitted. 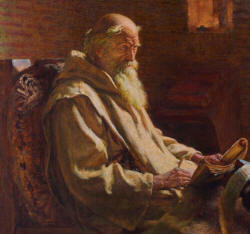 It is quite as likely that Bede should have been specified as any other person, for he was then about twenty-eight years old, and was already beginning to be well known for his extraordinary erudition, particularly in the Scriptures. It appears, therefore, on the whole, the wisest plan to adopt the explanation of Wilkins and Gaehle, who suggest that the death of Sergius, which took place shortly after the writing of the above letter, was the reason why Bede did not take the required journey. The Cottonian MS. above referred to, has not, as we have just seen, been appealed to for the first time. Usher quotes it (apud Wilkins) and says that the word “presbyterum,” priest, is wanting. He does not allude to the absence of the word Bedam, as thinking, probably, that it was an omission of the copyist.